If you have had cause to research genealogy in the Scandinavian countries, you know the many challenges that are faced in tracing your lines. The Swedish Demographic Database (DDB) produced and held at Umeå University in Umeå Sweden, provides seventy individual parish records available for research in the following regions: Sundsvall town, Sundsvall region, Tuna included, Linköping region, Skellefteå region, and some single parishes. 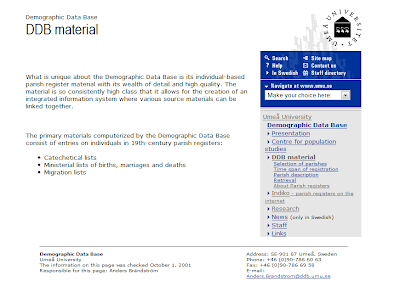 The Swedish DDB states their purpose is to produce and make "...population databases available for research. The primary sources digitized are parish registers from the 18th and 19th century, but also parish statistics from the period 1749-1859 have been recorded and made available in a database. These historical sources have a proven high quality and contain an amazing amount of information about the Swedish population, which is suitable for studies with a longitudinal and broad perspective. However, the DDB is not only working with historical material and producing databases with historical information. In close collaboration with Statistics Sweden DDB is developing a new infrastructure where historical data is being liked with modern population registers."